Hello everybody out there using minix- I'm doing a (free) operation system (just a hobby, won't be big and professional like gnu) for 386(486) AT clones. ^ Torvalds, Linus. Linux 5.1-rc5. LKML (郵寄清單). 2019-04-14 [2019-04-14]. ^ Debian GNU/Linux Licenses – Ohloh. ohloh.net. [2009-03-27]. ^ The Linux Foundation Trademarks and Trademark Usage Guidelines. The Linux Foundation. 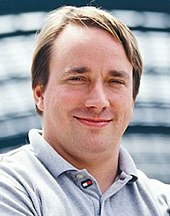 ^ Linus Benedict Torvalds. Free minix-like kernel sources for 386-AT. Newsgroup: comp.os.minix. 1991-10-05 [2011-09-30]. ^ What Is Linux: An Overview of the Linux Operating System. Linux Foundation. 2009-04-03 [2011-08-15]. ^ Weeks, Alex. 1.1. Linux System Administrator's Guide version 0.9. 2004 [2007-01-18]. ^ The GNU Operating System. Gnu.org. [2009-04-17]. ^ Top500 OS chart. Top500.org. [2010-10-31]. （原始內容存檔於2012-03-05）. ^ Henry Burkhardt, KSR. June 2011. Top500.org. [2011-09-15]. ^ Origins and History of Unix, 1969-1995. [2013-02-20] （英語）. ^ About the GNU Project – Initial Announcement. Gnu.org. 2008-06-23 [2009-03-09]. ^ 13.0 13.1 Overview of the GNU System. Gnu.org. [2009-03-09]. ^ Linksvayer, Mike. The Choice of a GNU Generation - An Interview With Linus Torvalds. Meta magazine. 1993 [2009-01-20]. ^ Torvalds, Linus. What would you like to see most in minix?. Newsgroup: comp.os.minix. [2006-09-09]. 1991Aug25.205708.9541@klaava.Helsinki.FI. ^ Chicken and egg: How was the first linux gcc binary created??. ^ Torvalds, Linus. Release notes for Linux v0.12. Linux Kernel Archives. 1992-01-05 [2007-07-23]. The Linux copyright will change: I've had a couple of requests to make it compatible with the GNU copyleft, removing the 「you may not distribute it for money」 condition. I agree. I propose that the copyright be changed so that it confirms to GNU ─ pending approval of the persons who have helped write code. I assume this is going to be no problem for anybody: If you have grievances ("I wrote that code assuming the copyright would stay the same"）mail me. Otherwise The GNU copyleft takes effect since the first of February. If you do not know the gist of the GNU copyright ─ read it. ^ The Linux Foundation; Staff. [2011-11-10]. （原始內容存檔於2009-04-19）. ^ The Free Software Foundation Management. [2011-11-10]. ^ The LWN.net Linux Distribution List. [2006-05-19]. ^ Santhanam, Anand; Vishal Kulkarni. Linux system development on an embedded device. DeveloperWorks. IBM. 2002-03-01 [2007-07-26]. ^ Lyons, Daniel. Linux rules supercomputers. [2007-02-22]. ^ Schrecker, Michael. Turn on Web Interactivity with LAMP. [2007-02-22]. （原始內容存檔於2006-12-31）. ^ Galli, Peter. Vista Aiding Linux Desktop, Strategist Says. eWEEK (Ziff Davis Enterprise Inc.). 2007-08-08 [2007-11-19]. ^ Paul, Ryan. Linux market share set to surpass Win 98, OS X still ahead of Vista. Ars Technica (Ars Technica, LLC). 2007-09-03 [2007-11-19]. ^ Beer, Stan. Vista to play second fiddle to XP until 2009: Gartner. iTWire (iTWire). 2007-01-23 [2007-11-19]. （原始內容存檔於2008-12-03）. ^ Operating System Marketshare for Year 2007. Market Share. Net Applications. 2007-11-19 [2007-11-19]. ^ Vista slowly continues its growth; Linux more aggressive than Mac OS during the summer. XiTiMonitor (AT Internet/XiTi.com). 2007-09-24 [2007-11-19]. （原始內容存檔於2007-11-13）. ^ Global Web Stats. W3Counter. Awio Web Services LLC. 2007-11-10 [2007-11-19]. ^ June 2004 Zeitgeist. Google Press Center. Google Inc. 2004-08-12 [2007-11-19]. ^ Brazil's love of Linux. [2009-02-21]. ^ Ashurst, Mark. Brazil falls in love with Linux. BBC News. 2004-02-01 [2009-02-21]. ^ LV: Minister: "Open standards improve efficiency and transparency". [2009-02-21]. ^ Linux Spreads its Wings in India. [2009-02-21]. ^ Kerala shuts windows, schools to use only Linux. [2009-06-22]. ^ China’s Microprocessor Dilemma. Microprocessor Report. [2009-04-15]. ^ Magalh?es equipped with Linux Caixa Mágica. （原始內容存檔於2011-01-21）. ^ Oferta CM no programa e-Escolas surpreende o mercado. （原始內容存檔於2008-06-01）. ^ Some countries are choosing Linux systems over Microsoft. [2009-02-21]. ^ TOP500.org. Operating system Family share for 11/2010. Top500.org. [2011-01-16]. （原始內容存檔於2010-11-17）. ^ TOP500 Press Release: Lawrence Livermore’s Sequoia Supercomputer Towers above the Rest in Latest TOP500 List. TOP500. 2012-07-14. （原始內容存檔於2012-06-24）. ^ 20 Petaflop Sequoia Supercomputer. IBM. 2009-02-03. ^ Firefox OS architecture. Mozilla Developer Network. Mozilla. [2014-06-13]. （原始內容存檔於2014-06-04）. ^ 疑點解析：Linux系統下的病毒少是為何？. 2008-09-12 [2013-07-02]. （原始內容存檔於2013年11月2日） （中文（簡體）‎）. Torvalds, Linus; Diamond, David. Just for Fun: The Story of an Accidental Revolutionary. Harper-Collins Business. Moody, Glyn. Rebel Code: Linux and the Open Source Revolution. Perseus Publishing. ISBN 978-0-7139-9520-6. Gedda, R. Linux breaks desktop barrier in 2004: Torvalds. 2004 [2004-01-16]. （原始內容存檔於2005-04-07）. Mackenzie, K. Linux Torvalds Q&A. 2004 [2004-01-19]. Greene, Thomas C. Mandrake 8.1 easier than Win-XP. The Register. [2005-12-22].